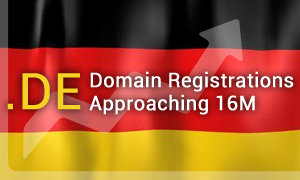 The number of domain names registered under the German country code domain .DE will soon reach the 16 million milestone, according to the .DE Registry. There are 15,997,182 domain names registered within the .DE extension at the time of writing this. The 15,5 milestone was reached in 2012 while the 14 millionth domain name was registered under the German domain in 2010. .DE is currently the largest country code TLD, and the strongest among European extensions, followed by .UK (the United Kingdom) and .CN (China). It has had the annual average growth rate of about 1 million domain names over the past years. The German ccTLD offers numerous naming possibilities, including one- and two-character domains, number-only domains as well as internationalised domains (IDNs) consisting of diacritics of German, such as the special character eszett, ß . If you wish to mark your online presence on the German-speaking market, consider registering a domain name under .DE. If you do not have a local administrative contact, Web Solutions can assist in that free of charge. To check if your desired domain name is available, click the domain of interest and enter the name in our search tool. If you need help, please do not hesitate to email us at support@web-solutions.eu or call us on +44 (0) 208 133 3994.